Internet blackjack information site Blackjack Info has announced that they’ve launched a new Blackjack Quiz, which puts you in certain situations and grades you based on your decisions. Some of the hands in the sheet are quite simple, where you’d always split 8s, but others are more difficult. Those hands include reading soft hands versus decent dealer hands and whether or not to hit against dealer bust cards. The quiz is 20 questions in length, and will give you analysis at the end of the test. Blackjack is a game of luck, but there is a good amount of strategy involved. This strategy is dependent on the particular game you play, the decks involved, and the various table rules. 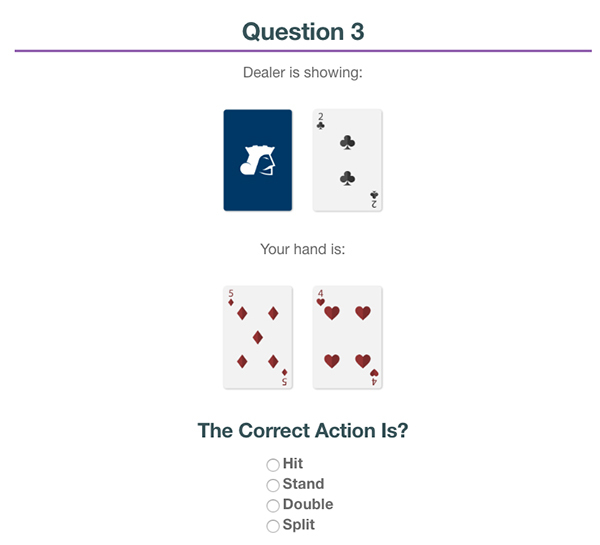 Regardless, this quiz is a pretty solid way to bone up on your blackjack smarts. This isn’t working for me. Says captcha code wasn’t responding. Dealer 8 vs 99… I said stand :/ should have split. Heya Ray, Tim here from Blackjackinfo. I just updated it, it should be working now.